House Republican leaders are waiting to see whether their appeal to voters will convince Democrat colleagues to allow a vote on a bill requiring medical care for babies who survive an abortion procedure. Pro-life lawmakers, led by the House’s top two Republicans, hope to force a vote on the legislation by using a procedure called a discharge petition. 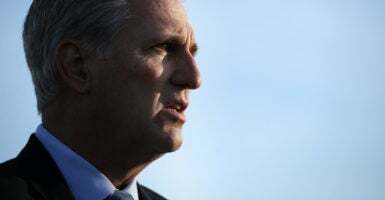 Minority Whip Steve Scalise last week urged Americans to call their representative in the House to request that he or she sign the petition, which requires at least 218 signatures to proceed. Democrats hold 235 seats in the House, Republicans 197. “I’m calling on every member of Congress to sign the discharge petition so that we can bring this bill to the floor, have this debate, so all the country can see this barbaric process of murdering babies when they’re alive is legal in many states,” Scalise, R-La., said Wednesday at a news conference also attended by House Minority Leader Kevin McCarthy, R-Calif.
McCarthy, Scalise, and other Republicans demanded that Democrats bypass House Speaker Nancy Pelosi’s authority to help set up a vote on the Born-Alive Abortion Survivors Protection Act. Besides requiring proper medical care for abortion survivors, the legislation would make it a felony to harm a baby who survives an abortion procedure. A Senate vote on similar legislation failed by a 44-53 vote Feb. 25, when all but three Democrats voted against the bill. Other House Republicans at the news conference were Reps. Liz Cheney of Wyoming, chairman of the GOP conference; James Inhofe of Oklahoma; Adam Kinzinger of Illinois; and Ben Cline of Virginia. Also attending were pro-life activists Jill Stanek, Olivia Gans Turner, and Melissa Cifuentes. It should be common sense in a just and moral society. This bill requires medical practitioners—those who have sworn to ‘do no harm’—to exercise equal care to a baby who survives an abortion as any other child, and provides criminal penalties for anyone who intentionally kills or denies lifesaving care to a child who is born alive after an abortion. While members of the Senate are on the record with a vote on this legislation, the Democrat leadership that controls the House of Representatives has blocked its consideration. They don’t want to have to vote on infanticide because they know the rest of the country doesn’t agree—77 percent of Americans support protections for abortion survivors and 62 percent oppose late-term abortion.